The very first test that evaluates the amount of cannabis present in the urine sample! Beyond a simple Positive or Negative result, you now know if the consumption of cannabis is LOW, MEDIUM or HIGH. 3 detection levels in standard version or 5 detection levels in extended version (for the detection of chronic consumptions). Made in France and ISO 9001/ ISO 13485 certified. At the forefront of cannabis screening, this test does not only say Positive or Negative, but also gives an indication on the amount of THC that is detected in the urine sample. This information is particularly useful for monitoring the evolution of a consumption or the successful conduct of a weaning. This version covers the concentration levels of THC which generally correspond to light, or even more or less regular, consumption. This version allows a more precise detection of the cases of frequent/regular or even chronic consumption, like the daily use of cannabis and marijuana. This test is extremely effective over time, when carried out in series (on a weekly basis, for example). A first screening serves as a reference test. The following tests will then show the decrease or increase in THC level in urine. By leading regular screenings, it will be possible to determine if the subject has stopped his consumption or if he has smoked again. Our advice: you can start by performing extended tests (5 levels), starting from the highest reference point and following the elimination of the largest quantities of THC. 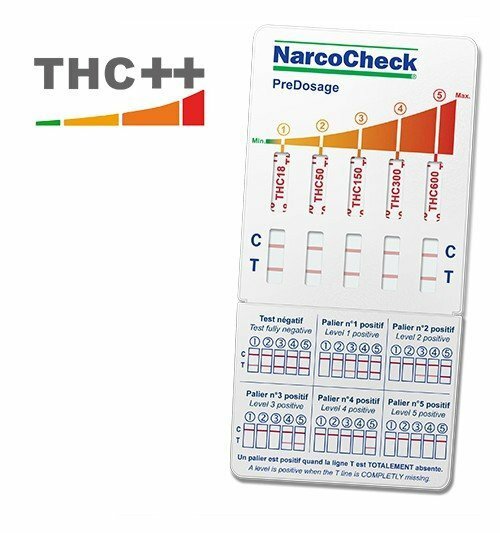 When levels 4 and 5 become negative, it will mean that the concentration of THC will have decreased significantly, and the monitoring can be continued with standard version (3 levels) tests until all remaining traces of THC are eliminated (all levels turning negative). In the event of re-consumption, you will immediately be alerted by the sudden increase of the positive level of the test. Parents who need to know the marijuana consumption habits of their teenagers, or who help and support them during weaning. Healthcare professionals, who need a rapid and inexpensive way to ensure that detoxification is keeping going as planned. Consumers themselves, who can finally understand how cannabis can massively and durably impregnate their metabolism. Many casual consumers would be surprised to find out how much their urines can be loaded with THC. Today's marijuana has nothing to do with the one used during the 1970s / 80s. Marijuana/weed and hashish are infinitely more powerful nowadays, as producers try to make their drugs more addictive to "retain" their customers. As a result, enormous levels of THC are ingested with each smoked joint. The point is to have them stop lying to themselves, because they would know now that some occasional joints can generate a strong and constant concentration of harmful substances in the organism, so cannabis can't be as safe as they wish it to be. Knowing that a teenager or a loved one is positive for cannabis is important, but having an indication of the level of consumption is even more necessary! This can help to evaluate the urgency of the situation. Indeed, people who smoke marijuana generally tend to greatly minimize their level of consumption. For parents, it is therefore difficult to know the magnitude of the problem. Now, thanks to the PreDosage system, they can have a clear indication on the level and habits of consumption of their teenagers. When a cannabis user makes a commitment to put an end to his addiction, the support of his entourage is absolutely paramount. Encouraging and motivating is an huge part of helping those who decide to quit smoking cannabis. But also needs to realize that this commitment cannot be made lightly. Initial screening tests with PreDosage help to maintain constant vigilance and to monitor the level of cannabis in urine. If the amount of THC in the urine goes up during this process, it may indicate a possible relapse. The entourage can then react without wasting time. If the weaning is respected, the former consumer should see his / her THC positivity reduced from level to level until a totally negative test after a few weeks. This finally negative test can also constitute an important psychological aid. Some will choose to save it, because it will be able to symbolize permanently the detoxification of their organism and the victory over the addiction. What do the different levels of this test reveal? Low THC (cannabis) concentration in urine. either the residual traces of a light or occasional consumption (in the last 24-72h). or, a more or less ancient consumption whose traces are being eliminated by the organism. Medium / significant level of THC in urine. This level corresponds to the international standard threshold for the detection of cannabis. either a habit of consumption more or less regular (at least several joints per month). or a rather recent episode of consumption (in the last 48-72h). or a possible resumption of cannabis use, if a previous PreDosage test was positive only at level 1. High THC concentration in urine. either a habit of regular consumption (probably one to several times a week). or a recent episode of consumption (in the last 48 hours). or a possible resumption of cannabis use, if a previous PreDosage test was positive only at level 1 or 2. Very high THC concentration in urine. either a habit of regular consumption (probably daily). or a very recent consumption episode (in the last 24 hours). or a possible resumption of cannabis use, if a previous PreDosage test was positive at lower levels. Massive concentration of THC in urine. either a very frequent consumption habit (at least several times per day). or a very recent consumption episode (in the last 6-18 hours). What does this test exactly detect? How long does cannabis remains detectable in the urine? The detection timeframe of cannabis use in urine varies depending on the metabolism and level of consumption of each person. 2 to 3 days after the last intake, for exceptional or occasional consumptions. 5 to 10 days, for more regular smokers (3 or 4 joints per week). 14 to 30 days (even several months), for heavy consumers (1 joint per day and more). Up to 40-60 days for some chronic consumers (several joints per day regularly). 1 to 5 days, when the drug is ingested (infusion, cake etc ...). 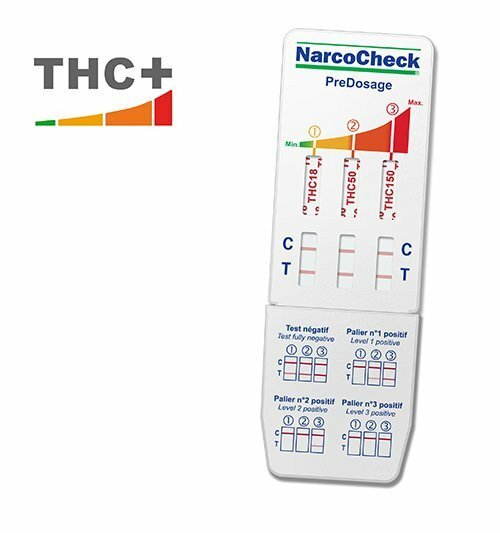 The NarcoCheck® PreDosage urine test is used to detect the presence of THC in urine. It is a semi-quantitative pre-dosage test, ie it is used to determine if the concentration of THC in the urine is low, medium, or high. * THC metabolite. It is this substance which is detected by the test, as it is the substance found in large quantities in urine after a cannabis use.